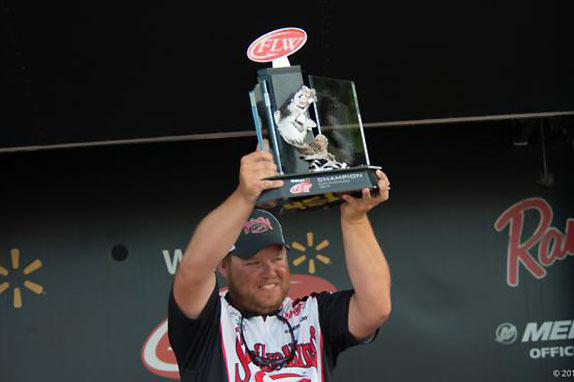 Michael Wooley averaged 23 pounds per day en route to winning the Lake Chickamauga FLW Tour. 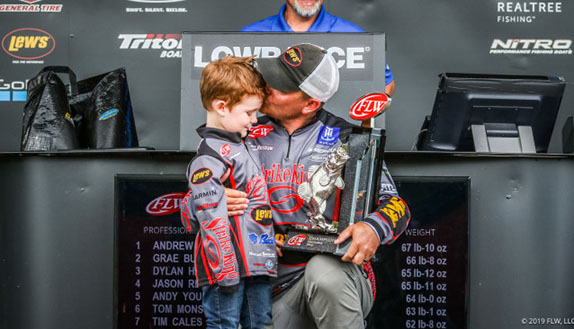 Most of the 147 competitors at last week's Lake Chickamauga FLW Tour didn't have the luxury of micro-managing their fish. They had to take what they could get � whenever they could get it � from schools of bass that were being divvied up among multiple anglers. Michael Wooley was an exception to that general rule. He discovered a hot spot in practice that would end up providing him plenty of fish for 3 1/2 days of the 4-day event. He could catch them fast and furious during their morning shad feast and then pull out, secure in the knowledge that they'd be unmolested until he returned the following day. 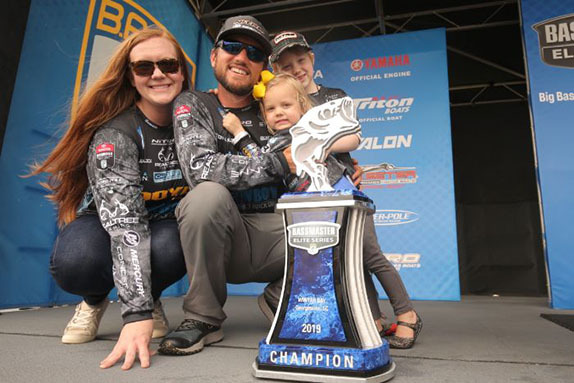 Wooley, a Tennessee River offshore specialist who lives about 4 1/2 hours from Chickamauga in Collierville, Tenn., transformed a lackluster season into something special by winning the fifth tournament on the six-event circuit. 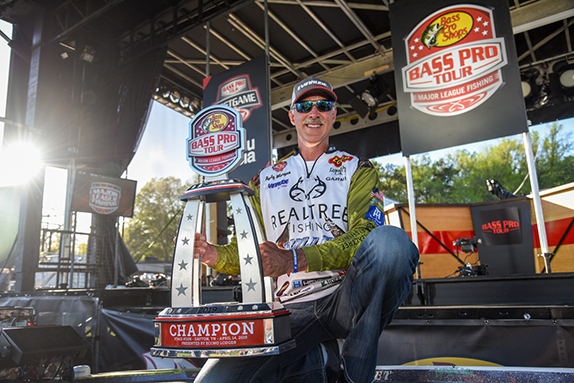 He took over the lead on day 2, extended his advantage on day 3 and held off a late rally by Stetson Blaylock to prevail by a margin of about a pound and a half. The second-year pro averaged slightly more than 23 pounds per day en route to a victory that rid him of concerns that the 2015 season would be a financial bust. At No. 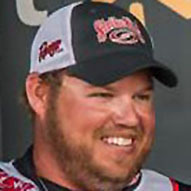 73 in the Angler of the Year (AOY) race, he's still far out of contention for a berth in the Forrest Wood Cup (an event in which he finished 8th last year), but he'll have the means to try again in 2016 if that's the route he chooses. Following are some of the specifics of his initial tour-level win. Wooley launched his boat at Chester Frost Park to begin the initial day of practice and headed downlake in the direction of the dam. He hadn't gone far when he idled across a bar where he could see quality fish on his graph. Just a few casts produced multiple 3- and 4-pound fish. He got out of there quickly before anybody could see him. He spent the next 2 1/2 days searching for additional schools and ended up with a list of about 20. "I was just trying to find everything possible, and I think I found every school on every community hole," he said. "The other ones weren't as (productive), but they definitely saved me on the last day." The bag that Wooley caught on day 1 was the second-best of the tournament, topped only by Bill McDonald's 29-12 haul that same day. It didn't take him long to compile it � he had all of that weight by 8:15 a.m. The top of his bar (he said it also could be referred to as hump, a horseshoe or a saddle due to its configuration) was covered with mussel shells. It came to a defined point on one end, and that's where the fish were sitting on the first day � in approximately 13 feet of water. He tried to make them eat reaction lures, offering up a swimbait and Strike King 6XD and 10XD crankbaits. For the most part, they'd have none of that, so he resorted to dragging jigs and worms. That was much more to their liking. "I don't know if it was timing or what," he said in reference to his dearth of action on the quicker-moving baits. "We also lacked current a lot of the time, too, and that might've played a role. "A lot of the guys who caught them on reaction baits were getting them at 2 or 3 in the afternoon, and by that time I wasn't doing much fishing. I was idling around looking for other stuff." The start of day 2 featured overcast skies and his fish wouldn't bite early. He waited them out, though, and when the sun emerged shortly after 10 o'clock, he again loaded up in a hurry. He caught them from the top of the bar, which was a foot to 3 feet shallower than the point, and that's where they'd be for the remainder of the event for the short periods when they were in a cooperative mode. He had a 4-pound lead when he launched on day 3, and another quick early-morning flurry like the one he experienced on day 1 added 2 pounds to his advantage. He'd need that additional weight on the final day. His best spot gave him only two fish on day 4 before he pulled out at mid-day. He completed his limit and caught his best specimen of the day � a 4 3/4-pounder � from another locale at the mouth of that same creek. "It never was a spot where you could catch 20 or 30 or 40 fish," he said. "I never caught more than about a dozen a day, but they were all quality fish. "(On day 4) I was hoping it would give me seven or eight more, but I only caught the two keepers and a short fish. I might've run out of big fish, but it was also really hot and bright and slick that day and that might have had something to do with it." > Jig gear: 7'3" medium-heavy Dobyns Champion Series rod, Lew's Tournament Pro casting reel (7:1 gear ratio), 17-pound Seaguar InvizX fluorocarbon line, 3/4-ounce Strike King Tour Grade football jig (green-pumpkin), Strike King Rage Tail Lobster trailer (green-pumpkin). > Worm gear: Same rod, reel and line, 1/2-ounce hand-poured shaky-head jig, Zoom Magnum Trick Worm (green-pumpkin). > Main factor in his success � "Just my knowledge of the Tennessee River helped me out a lot." > Performance edge � "The Lowrance electronics were absolutely critical for finding those fish." "My dad. He's the one who got me into the sport." "I really don't have one right now." "I just have a passion for the outdoors and I love fishing."